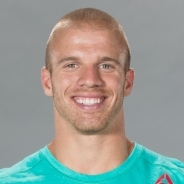 Scott Panchik, a five-time individual CrossFit Games veteran, has qualified for every CrossFit Games since 2012. Never finishing below sixth, he took back-to-back fourth-place finishes in 2012 and 2013, missing the podium by just one place each year. Victor of the 2015 and 2016 Central Regionals, Panchik is known for his mental fortitude, always believing he can win while remaining unruffled by setbacks. A collegiate running back, Panchik owns CrossFit Mentality in Mentor, Ohio.